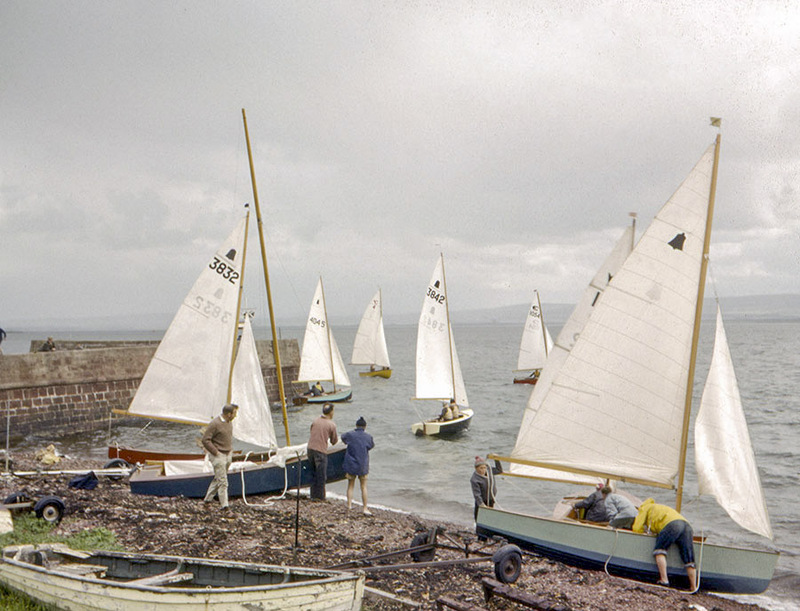 The Seafly (yellow hull, off breakwater), a Graduate and a Mayfly (behind foreground GP14) are outnumbered by GP14s on race day at Chanonry SC, Fortrose, 1963. Seafly C4 “Fidget” belonged to my late father, Rae Wilcox. The photos were both taken at Fortrose in 1963. My father was a Ministry of Agriculture vet in Dingwall and this was his second boat. His first was a Tutor 10, which he bought in 1957 and used on family holidays on sheltered lochs in Wester Ross. 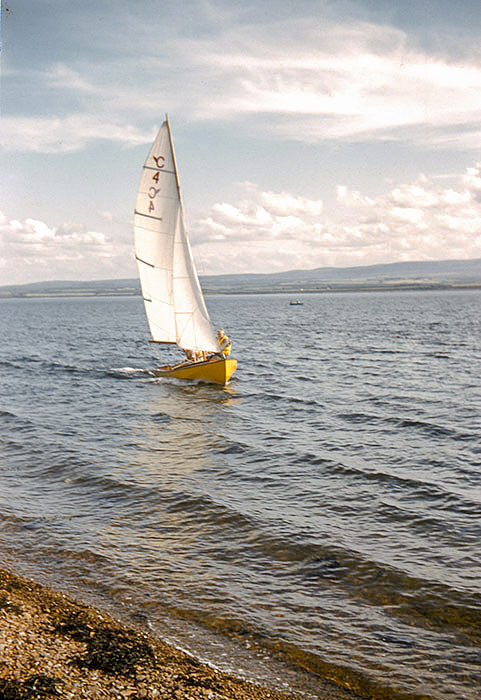 In 1959 he joined Chanonry Sailing Club on the Beauly Firth. 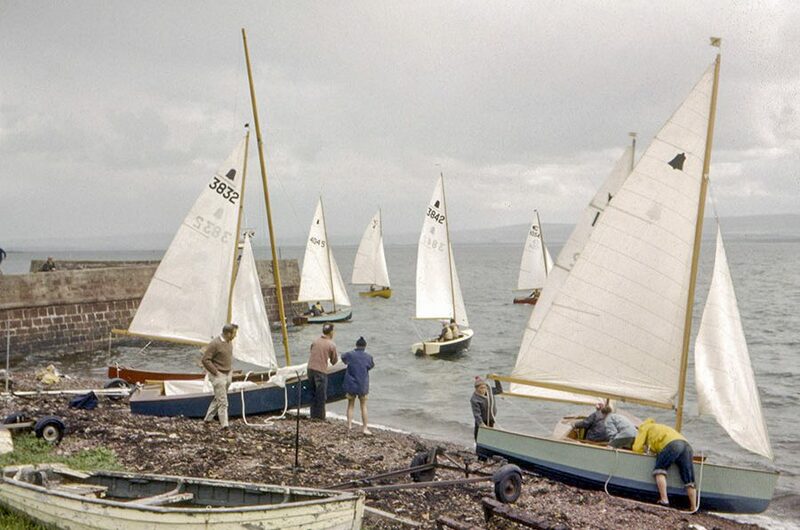 Seafly C4 at Fortrose 1963. He quickly realised that he would need a bigger boat for the choppy waters there. 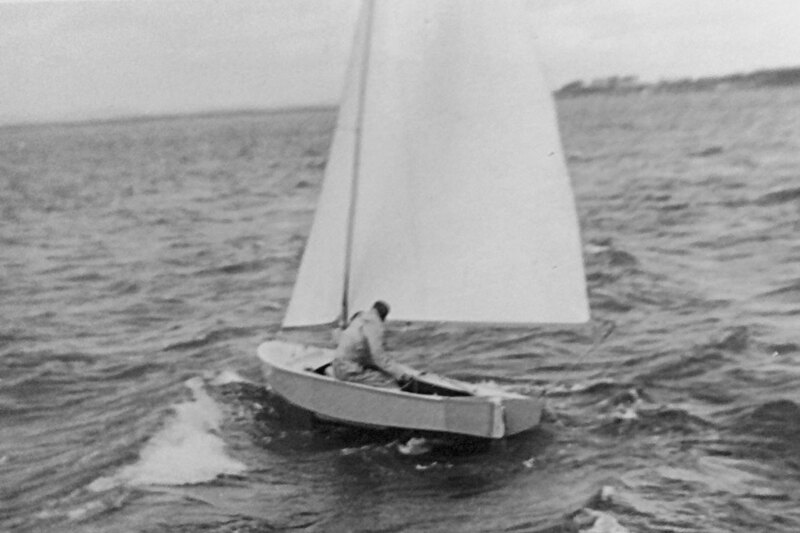 Most of the club sailed GP14’s but he was impressed by the club’s solitary Mayfly, which had been built by Elders of Troon. By coincidence, my mother’s brother sailed at Troon with John MacKinnon whose family owned Elders. 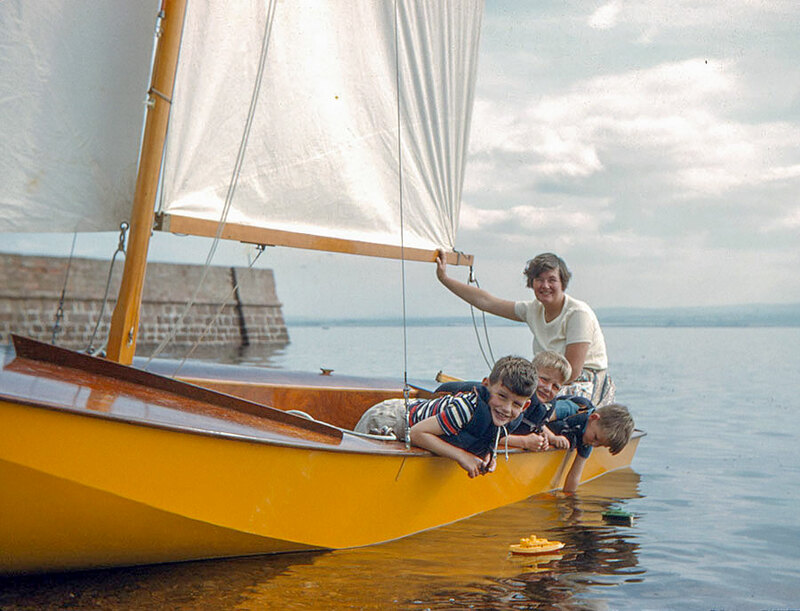 John’s father Charlie had built the Chanonry Mayfly but he advised my Dad to get the bigger Seafly, which was just about to be released. Elders could not get hold of one so my Dad drove all the way from Dingwall to Dawlish in early spring 1960 to collect a part completed boat. He decked, varnished and painted it in time for the 1960 season. He called her “Fidget” because my P1 teacher used to tell me to stop “fidgeting”, but I had no idea what that was! Fidget taken in 1962 with my Mum, myself (at front) and two brothers. The Seafly proved well suited for the waters of the Beauly Firth but sadly my father got moved south and faced a year or two without sailing, so he decided to sell her to Dennis Manson at the end of the ’63 season. Dennis had crewed for him in handicap races at Chanonry, where the Seafly proved consistently faster than the GP14s, especially downwind. My Dad often wondered why his sails did not have the red stripe. Fidget’s sails came with the kit from SDBB so I guess Seafly number 4 was delivered before they had “finalised the look”. 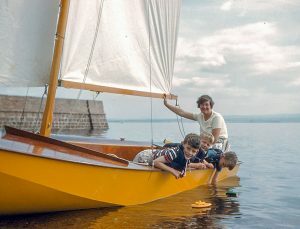 I know my Dad bought the boat before the Seafly was advertised and it was only through his connection with Charlie MacKinnon at Elders boat builders that he discovered it. Interestingly my uncle Iain Black and Charlie’s son John went on to be founder members of Troon Sailing Club. My uncle was first commodore and being an architect designed the clubhouse. 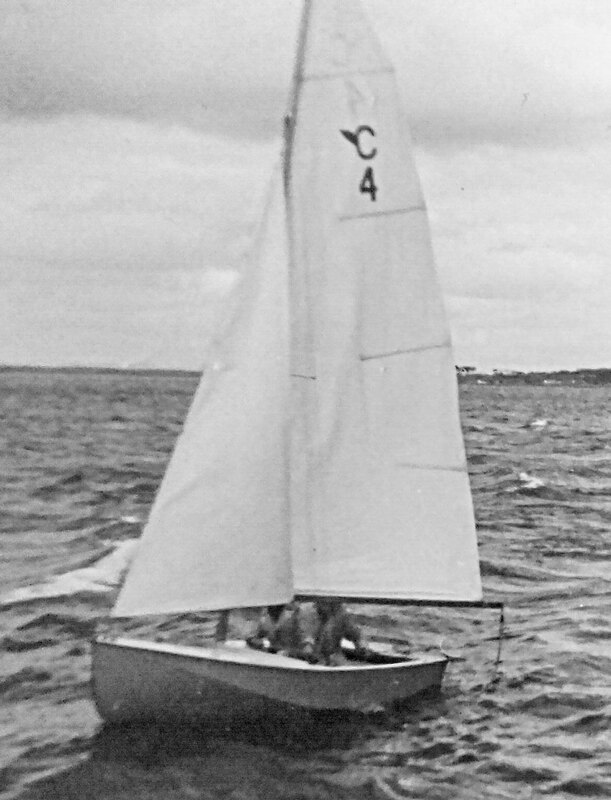 I had Seafly 4 “Fidget” as a boy in 1963/4 when we lived at Cromarty in Scotland. The boat was built by a local Vet who I crewed for and I bought it when he left the area. Very safe and lots of fun crewed and/or single handed. Sailed around the Cromarty and Moray Firths. Enjoyed the web site. While looking for other things I have just come across these pics taken by a family member. 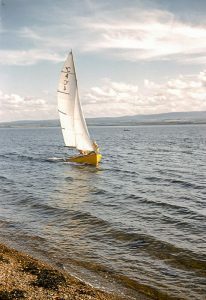 They were taken shortly after my acquiring Fidget C4, and it looks like I’m preparing for a race at Cromarty. I was aged seventeen then. Sorry that they are only black and white. It was good to read the update entered by Rae Wilcox’s son. I often wondered what happened to the family.